What is one of the most compelling and incredible experience that you’ve had while being a doctor? Let me share with you the case of Addisonian crisis. It was on the Christmas Eve of 2015 when I tried to sneak into the surgery unnoticed to start my morning clinic ( I was late), when I was stopped by our receptionist. She said , “come here!, come here!”, as she pulled me into the patient waiting area. Initially I thought there was an emergency so my adrenaline started to run preparing to resuscitate someone. I was pleasantly shocked to see the patient that I had sent to the hospital the previous week , carrying a fruit hamper and a card. She was also accompanied by 3 members of her family. She had come in person to thank me for “saving her life”. She was told that if I had delayed in calling an ambulance she would have died. She had presented to me the previous week complaining of vomiting and not able to keep anything down. She was also feeling dizzy and sleepy as well being unsteady on her feet. I quickly examined her and I could not get her blood pressure. I tried several electronic machines and also tried taking the blood pressure manually without any joy. The rest of examination was fine but she did not look right. She wanted me to give her an injection to stop the vomiting so she could avoid going into hospital. I remember her reluctance to go to hospital and me explaining my worries that she was in an “Addisonian crisis” since she was on long term steroids but could not take them due to vomiting. She had been on a long term steroid called prednisolone for her inflammatory tummy problem called colitis ( inflammation of the colon). This was a patient on long term steroids tablets but could not take them as she was vomiting. This meant that she was not getting her steroids and her body was not making any because of long term use of steroids tablets. See a detailed explanation below of Addisonian crisis. I was humbled by that experience and reflected on it . It was incredible as I remembered that at one point in my mind I was about to give in and defer referring the patient or even calling the ambulance. In the medical field I have always learnt that my gut feeling or initial instinct must come first. This is one of those incredible experience as a doctor that you cherish if you get it right . You cannot explain how you got it right but you just know that you had to act and act very fast as every minute matters most in those situations. In Addison’s disease, the adrenal gland is damaged, and not enough cortisol and aldosterone are produced. The adrenal glands are two small glands that sit on top of the kidneys. They produce two essential hormones: cortisol and aldosterone. These hormones are needed for the body to fight illness and cope with stress. The condition is usually the result of a problem with the immune system, which causes it to attack the outer layer of the adrenal gland (the adrenal cortex), disrupting the production of steroid hormones aldosterone and cortisol. We are not sure why this happens. 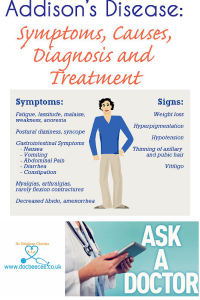 Stopping steroids can cause Addison disease. Synthetic steroids (corticosteroids) such as prednisolone which are similar to the natural cortisol, are used to treat several medical conditions. If one takes prednisolone for more than a few weeks, the adrenal glands will decrease cortisol production and can even stop completely. So, one will be living with a body that’s relying on a drug to get enough cortisol to function properly. This means that those that are taking steroids tablets must not stop them abruptly as this will not give enough time for the adrenal gland to resume the production of cortisol. A gradual reduction in prednisolone dosage is advised as it gives the adrenal glands time to resume their normal function. Please note that if you take steroids for just a week at most you do not need to reduce them gradually,it’s fine to stop abruptly in these situations. If steroid tablets are then suddenly stopped there may be a problem, as the adrenal glands won’t have had time to make the cortisol needed. This problem is called adrenal insufficiency. Signs of adrenal insufficiency include weakness, fatigue, fever, weight loss, vomiting, diarrhoea and abdominal pain. 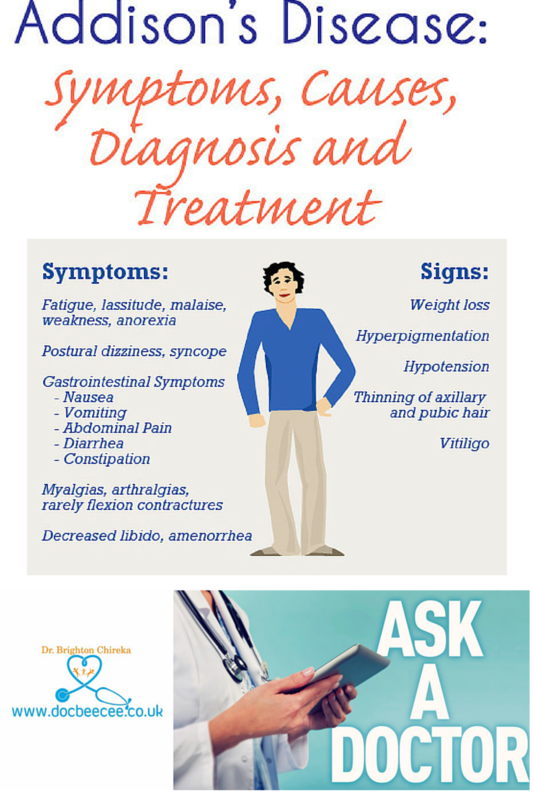 If one experiences any of these problems, they should seek medical help immediately. 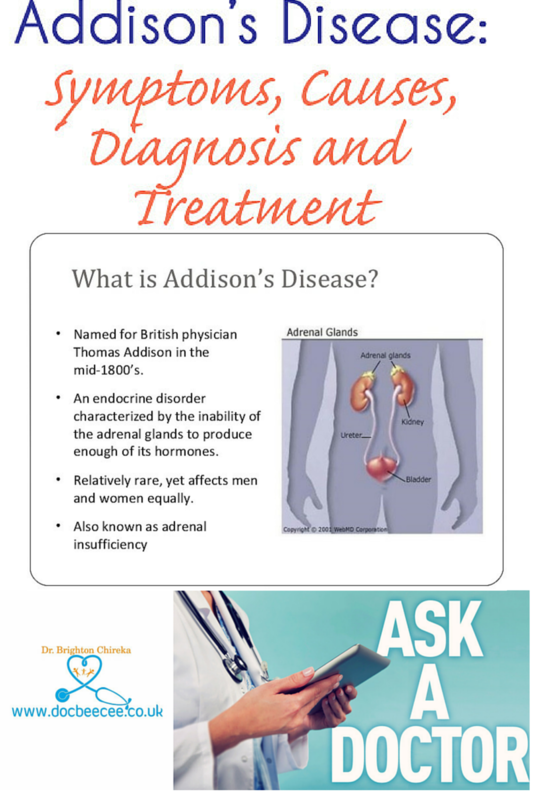 If Addison’s disease is left untreated, the levels of hormones produced by the adrenal gland gradually decrease in the body. This causes the symptoms to get progressively worse and eventually lead to a life-threatening situation called an Addisonian crisis. 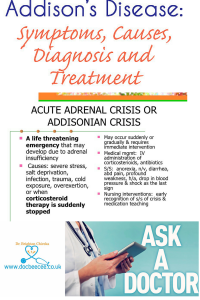 During an adrenal crisis, the symptoms of Addison’s disease appear quickly and severely. My patient presented with a crisis as she was vomiting and not able to keep anything down for a few days meaning that she was not able to take her steroid tablets and her adrenal gland was not producing any cortisol. 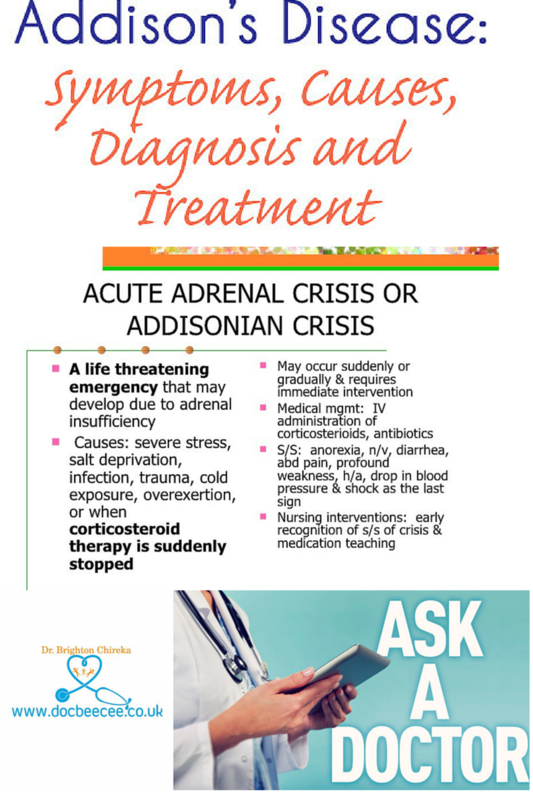 An adrenal crisis is a medical emergency. If left untreated, it can be fatal. If you think you or someone you know with Addison’s disease or on steroids is having an adrenal crisis, call an ambulance urgently. In United Kingdom dial 999. If an adrenal crisis isn’t treated, it can lead to a coma and death. There’s also a risk your brain won’t get enough oxygen if treatment is delayed, which can cause permanent disability. Looking back I can say it was the right call but could have been easily missed.